No single piece of equipment captures the story of our outdoor adventures like the one that tracks every step and then plots it on a map afterward. It can show the terrain, elevation gain, elevation loss, pace, heart rate, and route, and then drop it all neatly on a map. While there are a plethora of devices on the market that can help you do all this, only a few have the battery endurance to stick with you through the really long adventures like a 100 miler without some sort of compromise. Enter, the Suunto 9 Baro ($599/$649 without/with heart-rate chest strap). Big endurance events is where this device shines, but it also has a lot of the modern features of a day-to-day health tracker. You not only can capture that 24-hour backcountry push without bringing along an extra battery charger but you can also track steps, sleep, and your daily heart rate to get a full view of your health statistics and improvement. While all of this sounds excellent, like any piece of hardware, there are some shortcomings. The device itself is sturdy and confidence inspiring when you put it on. It is when you connect this device to Suunto’s backend software platforms (yes, plural) the cracks start to show. Not a deal breaker in itself, this does illustrate that making good hardware and software is not an easy task. Hey, and welcome to Trail Trials, the video review section of iRunFar. 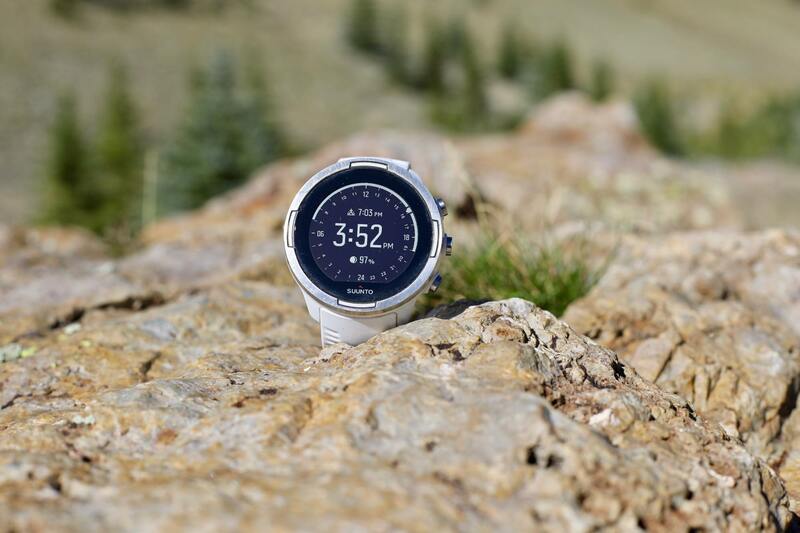 My name is Travis Liles, and in this video we’re going to take a look at the Suunto 9 Baro. Before we get going, I want to throw a disclaimer out there. Generally, our reviews cover things like shoes and jackets and those kinds of things, things that are static. While we can talk about tread and shoelaces and materials that are used, that thing is what that thing is. With an [electronic] device, especially now, things change over time. 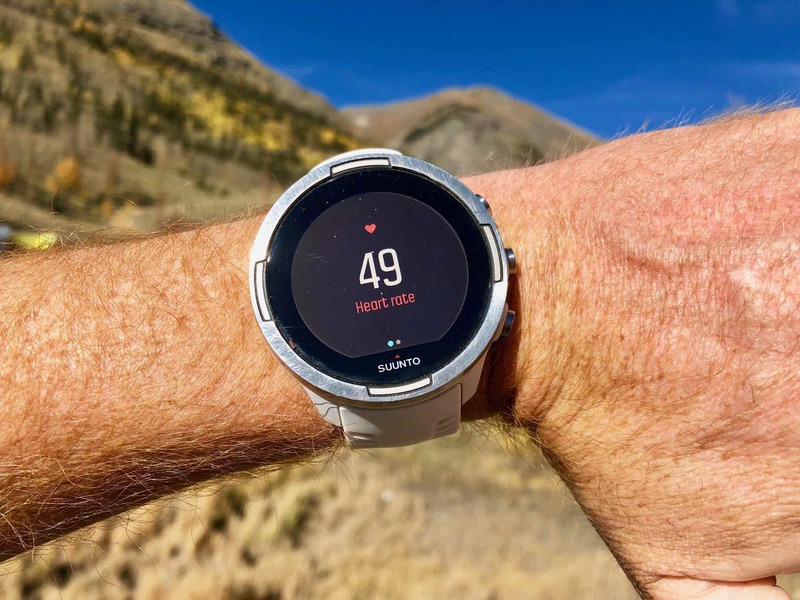 Six months from now, looking back at this review, there may be features added to the device [via firmware updates from Suunto] that are enhanced or make it perform better or add new things to it that don’t exist right now. With that in mind, what I want to do is talk about the device and what are its features and what it does. Then, specifically, I want to concentrate on two features of this device that I feel separate it from the tens of twenties of hundreds of other types of devices you could use to go out and track your ultrarunning and running adventures with. With that in mind, let’s talk about the basics. This is the Baro edition, which means it has a built-in barometer. What that means is on top of using GPS data to find your altitude and how much you’ve climbed, it’s also using barometric pressure. It can do other things as well like weather alerts to tell you if a storm is moving in and alert you on the device. This one has all the stuff of the Suunto 9 collection—again, this is the Baro edition. What else does it do? It’s a GPS tracking device. It has built-in heart-rate monitoring. 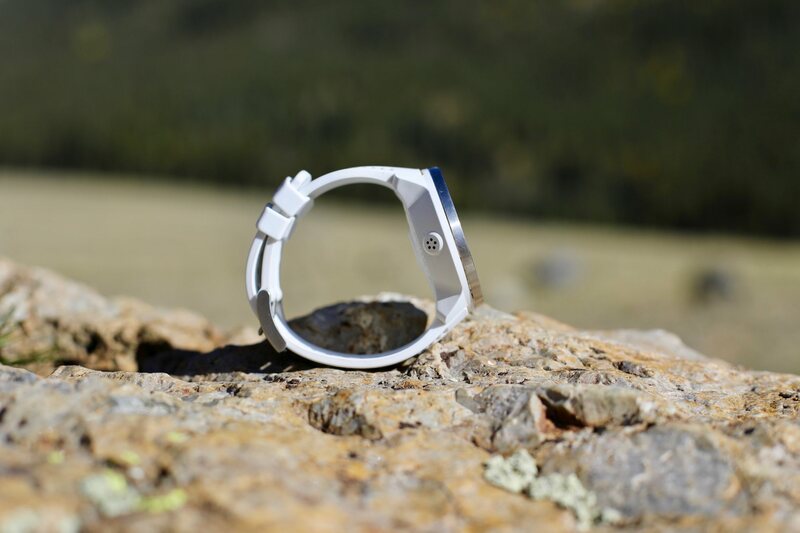 You can use it with a heart-rate strap, but like a lot of the industry, it is moving toward wrist-based tracking. That wrist-based [technology] can be used not only in activity tracking, but it can also be used for day-to-day activities. What is my resting heart rate when I get up? What is my resting heart rate throughout the day? We can also do things with the device like tracking steps. It’s a daily-activity tracker as well as tracking things like sleep. 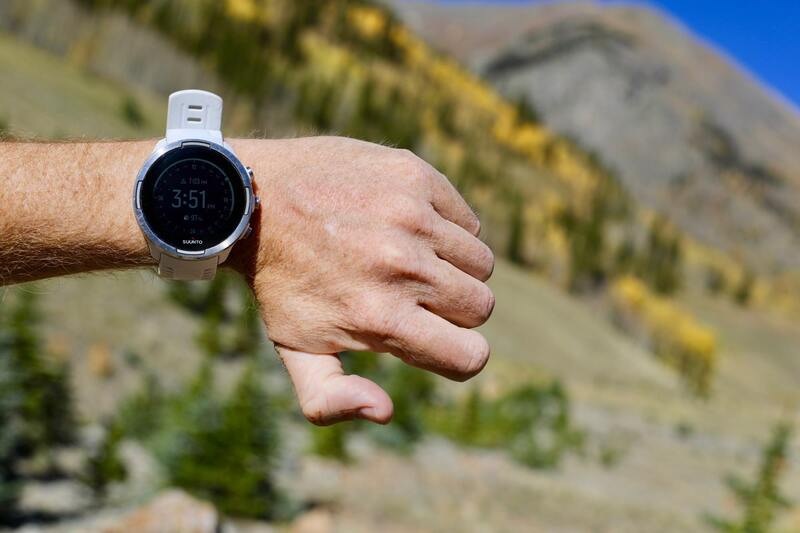 This device, while yes, is built for that audience of ultrarunners and people who do big things outdoors and spend lots of time in remote places and need things like weather alerts and battery to get through a 24-hour-plus activity, it can also do things like what we see for standard activity trackers. How many steps did I walk today, what’s my resting heart rate, and did I get my eight hours of sleep that I’m looking for? What are the two things that separate this thing from the herd? One is the intelligent-battery features and the other is the FusedTrack technology. Let’s dig in and talk about what those things are. For the intelligent-battery features, I’d argue that this is probably the most interesting of most of the devices out there, and I’m actually surprised we haven’t seen this on something before. We’ve all sort of tinkered around with devices and, How do I keep it charged and I carry a battery pack around with me because I know it’s going to die at 18 hours or whatever that thing is. There’s always been this idea of, It would be really great if I could figure out a way for a device to tell me, based on your settings, you’re going to get this type of battery life. And if something happens like a limited view of the sky and it’s cloudy or whatever, that device, if the battery is dying quicker than assumed, drops down and gives me an option to continue tracking while maybe not as accurately, but it allows me to get through my adventure or race or my run and this device not die. A side view of the Suunto 9 Baro. That’s exactly what this watch does. The way Suunto does this is with what are called intelligent-battery modes. The modes go into a couple different categories. You have Performance which means it’s going to ping the GPS satellites at every second and give you the most detailed data it can. In Performance mode, we’re looking at about 24 hours of battery life, which is good for almost all things. The second one is Endurance mode, which moves us up to a 50-hour training. From there, we go onto what’s called Ultra mode at 120 hours. All of these things get less and less accurate as we go. Performance is going to give you the best amount of data and lay down your track the most accurately on the map and have your data points lined up because it’s pinging every single second. As we move farther up, we’re moving into multiple seconds or even minutes between the time these devices ping. Again, depending on the type of activity and how long you’re going to be there and what your access is to figuring out if you can charge it up, it gives me this recipe for making sure my watch is going to keep going even when my normal one might die. What else is interesting about this? That’s the set up in the beginning. The nice thing about this is I can change it at any time that I want throughout an activity. For instance, I could start out from my house in Performance mode and my watch has 25% battery. I assumed I was going to get through my activity that day. I may look down and go, Oh, I’m not going to make it. I’m going to go ahead and change this on the fly. The other thing the watch will do is actually pop up and say things like, “Hey, based off what you’re going, you only have one to two hours of battery life left. Would you like to change to a different mode to make sure you can get through it?” You can make those decisions on the fly as you go. One of the things I find really helpful is that the device will not die completely. It will actually move to an old-school, classic chrono mode where it shuts off all the things and continues to track regardless of the fact of the battery being dead. There will be no GPS, but I can actually stop the watch at the end and say, That took me six hours and 10 minutes, versus the old model where my watch would just die and I wouldn’t have anything on the display at all. Next up, I want to talk about the FusedTrack technology. The FusedTrack technology actually plays into the battery mode we talked about. This, to me, is also a really interesting function of this device. The device, having GPS in it, knows where you are. You start it, it has a point, and it’s going to drop that point on a map. It also has other data that it knows about that point like barometer or altitude. The device will actually use that sensor data along with the swinging of your arm that it gets from that daily-tracking type of stuff to make some assumptions about your route. Let’s talk about a practical example of how that works. Right here above me I have two screenshots of a run where I did the exact same route on different days using different settings on the watch. One of these [left on screen] shows the normal Performance mode, getting tracks every one second. That one does exactly what you’d expect. It follows the route every second and gives me all this data. The one on this side [right on screen] used the FusedTrack technology. I turned it off and put it in the Ultra training mode with the huge battery life and went out and let the device do its thing, which is every couple minutes to record my location via GPS. But what it’s doing is filling in that data it doesn’t have with other data it knows about. What are those things? It knew my starting point, from when I took off. It knows my altitude as I go. My barometric pressure, as I climb it gets barometric data—you’re going uphill, so you must have gone this way. Point A is here and Point B is here and you went uphill, so this looks to be the location you traveled. This is all done trying to fill in the gaps with other sensor data that the watch has on it. This blows me away because it was able to create a pretty like track without having every second data. Why I bring this up is because this, to me, is really incredible. Yes, the track is a little bit different. In fact, it’s actually a little bit longer than my one here on the other side that is the very specific high Performance GPS tracking, but I was still able to lay down a really good track using sensor data while having a watch that would last for five days. A back view of the Suunto Baro 9 showing its optical heart-rate sensor. Let’s talk about a couple of downsides to this device. One is the software platform currently. There are two plays where this device comes in. You have the Suunto App, which is Suunto’s acquisition of a company called SportsTracker. That’s where you track some of your data at or you can track all of your data if you choose. Then there’s the old world of Movescount, which if you’ve been in the Suunto ecosystem at all, you’ll know Movescount is where you have your data, where you plan routes, where you can have that data and go to Movescount and go out to third-party services like Strava or whatever it is you might use. On the Suunto App side, we lose some of that ability to share. We lose some of that, what I would call really great features in terms of building out big routes in the middle of nowhere and those types of things. It just doesn’t work quite as well. Where do I change my screens at? What are my best ways to interact? I have to have two log ons. The software platform will evolve, and that’s why I brought up that at the beginning of this. Over time, we expect that to get better and we expect the migration of those two platforms together, but right now it’s just something you have to look out for. You can get by and use Movescount and be perfectly happy with this device, but if you want to start adding in those day-to-day tracking features like steps and heart rate and sleep, you’re going to have to sync to two platforms at the same time. Maybe it’s not a big deal, but it’s just something you’ll have to keep in mind if you’re looking to use this device in whole and not only that thing you use for activities but also for day-to-day things like steps and heart rate and sleep tracking. The other thing is the wrist-based heart rate—I have really small wrists as you can see from here. This is a big watch with a large face on it, and I don’t always get what I hope for in terms of readings. In fact, Suunto even put a tutorial in their app to show you the best way to wear this watch to get the best types of readings from it. I’ve tried all types of things in terms of locking it down really, really tight—which I will say, this band does an excellent job of doing—to shaving part of my hair off my arm so it got a better reading, and it’s just kind of hit and miss in terms of [heart-rate] activity tracking. I think day-to-day walking around it’s fairly reliable and does a good job. You results may vary, which is always with these types of things especially if you have darker skin tone or lighter skin tone. There are all kinds of variables that come into play with heart-rate reading. For me, I guess it’s probably small wrists and big dial that makes it not lock down for me. The Suunto 9 Baro tracking resting heart rate. To wrap things up, who is this device for? It’s not for a person that wants a traditional or even what we might call a new smart watch. You can’t install apps on it. You have a limited number of pre-installed faces that have colors that you can change for a little bit of customization. It does notifications, but you can’t really reply to them in a much more than a yes-and-no-type of way. It’s not a smart watch, but it has some of those baseline features. It has activity tracking but there are some software nuances with it. Where this thing shines is with big adventures in big places. I want to track a 20-hour run, and I want to know if it’s going to storm during that. This watch does it. I want to go for 120 hours. I want as good of GPS performance as I can, but I still want to track that and hope that it’s as accurate as possible. A, it can do that. B, it has all this cool fused technology that it can pull sensor data, it can pull GPS data, it can pull altitude and barometric pressure, and it can take all that and build out this track you lay and fill in even when it doesn’t have an actual data point for every second. I want a device that is sturdy—it’s that as well. This thing really checks the boxes for an endurance athlete. It is purpose-built, and I feel it hits on all those check boxes really well. If you’re looking for a device that can get you through your ultramarathon pretty much regardless of distance, this thing is going to do it. You can do it stair-stepping your way down from really good performance to, again, performance that can last 120 hours. Then the intelligent battery features where it, “Hey, it looks like you’re probably going to go for a big run on Saturday because that’s when you usually do it. Don’t forget to charge it up.” There are some neat things like that that are built in as well. But when it’s all said and done, having a device that can last an entire big race is what I tend to look for in a device. A device like this is doing exactly that. As always, any questions or comments, place those below the article. Thanks for watching, and we’ll catch you next time. The Suunto Baro 9 on a man’s wrist for scale. Bad GPS, horrible wrist heart rate, no apps, no workouts, almost no data screens configuration (only what’s built in). Unless you need 72 hours of straight battery, don’t buy this watch. While i haven’t had GPS issues I agree on the wrist HR comment. While I don’t expect wrist based HR to be as good as the strap measurements for more instantaneous measurements, I do expect at least a similar average over the course of a workout. This watch hasn’t been within 30% of strap measurements (wearing my garmin on the other wrist with a strap). I’ve also tried a garmin forerunner and it was much more accurate compared to a chest strap (~10% off). If you are considering getting this watch and using HR as part of your workouts make sure to order the bundle with the HR strap. Which is unfortunate. Otherwise the battery is tremendous. Disagree with you Courtney. The oHR isn’t great for me either but I have seen some that it works near perfect for. My GPS tracks are fantastic, as good as my A3P. There is extensive configuration available that you can access on the Suunto app on the phone. Correct, it does not have apps but I don’t know what you mean by no workouts. There is a workout planner if you use Movescount and an Interval setup and screens on the watch. Can you create interval training workout like in A3P? I dont think so but i am not sure. Can this watch track open water swimming activity? You can set up interval training when you start an activity. It’s really easy. Love the design of this watch! I have been with Suunto since the Ambit 2 and into the Ambit 3 (only upgrading because I wanted to sync via blue tooth to my phone immediately instead of having to hook up to the computer) and can say I have always appreciated the fact they don’t ignore who the watch is made for by adding all the smart watch junk like other brands. It really appears they know they are aiming this device at people who are long distance/time endurance athletes who want to focus on their sport specific data with as much accuracy and battery as possible. 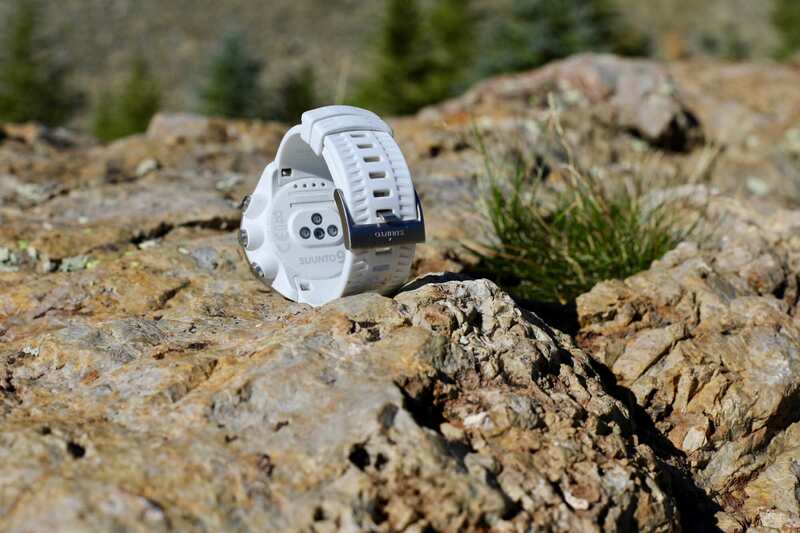 Do you know if this, like the Ambit watches, has NANT support or multi-sport support? I was wondering if you can use something like the Roche heart rate arm strap as supplemental heart rate monitoring or if you have to use the built in hear rate monitor. Also, for step tracking, have they added a way to adjust your steps based on your strde? This was an added feature in the Ambit line, but it really ended up being a half baked idea that really did not work well. Thank you for the great review. The Suunto watches are made to last, I am going to try to stick with my Ambit 3 for a bit longer as a color screen and a few new features that are ‘nice’ are not enough to get me to buy a new watch. I think you might be referring to the Rythym Scosche arm-band heart rate monitor, not the “Roche”. I have been using this arm-band heart rate strap for several years with very good success. I place it on my upper arm. I have the original strap with 12 hours of battery life but there is a new version out with 24 hours of battery life. It needs the watch to have bluetooth capability which I think most have. Lol, yes, autocorrect for the win. Most of the Suuntos have replaced NAnt with blue tooth. Which ever model if Scoche I got, only has 8 hours. I need to invest in one with a longer battery. Thanks for the correction. Had the amnit 1 and amnit 3 and loved them, never any issues. Got the 9 and its been problems all the way. It does not record the gps plot when powersaving is enabled and now during my last couple of runs the altimeter data is way out – saying 600 metres of ascent when it really shoud be 100m etc. Ive reset and done all that but its still doing it. Customer service has been crap- you email and its a week before they respond. Just downloaded the latest software and maybe they have sorted issues out. Used it for a big european ultra there and distance wise it was spot on but ascent wise it was 900 metres out. Same here, I had the Ambit 2 and that thing was solid and reliable like a tank, I don’t recall having any issues in 4+ years. Now the only issue I had was the battery life as it was clearly not long enough for 100-milers and a bit short fonr long adventures. Carrying an extra battery was just not ideal. The OHR (Optical Heart Rate) used to be pretty inaccurate but with the last firmware (2.4.14 : “Release note : The update has dramatic OHR improvement for running and walking, GPS improvements and much more!”), the values seem to be better (at least not worse than when wearing my chest strap). All in all and like Travis said, the watch will be evolved but I find it a bummer that they release what seems like a half-baked product. Ambit 3 peak user here. No issues and not planning to upgrade as Ambit3 still going strong.Best watch @ the price. ( looks a part but with all the issues – F*** IT! The Ambits are solid, extremely well made watches. My Ambit 2 still functions perfectly, just did not have blue tooth. I think these should last go a very long time. Thanks for this review. My opinion about the Suunto 9 is slightly different. The watch itself is solid and the battery is a very nice feature. But this is actually everything positive that I can say. The heart rate on the wrist is just not working, no matter if you have small wrists or not. I guess I have probably the average wrist and the heart rate moves from 135 to 180 while a constant speed run. So I bought the HR belt and used it without issues for now maybe two months. Since two weeks it starts to show me fantasy data – at least I didn’t run an average km with a heart rate of 240 before I got the Suunto 9. The elevation data works sometimes good, sometimes it shows me that I ran 3000 m up in just two kilometers on a flat road. Like you said, the app situation is ridiculous. There are two apps – but for the moment you can’t use it together. While I was trying the new Suunto App, my Movescount App doesn’t want to show my activities anymore. The only solution after several hours to fix this problem was to delete the new Suunto app and connect again with the Movescount App. In general, during the transfer to Movescount every second or third activity disappears in a mysterious way. All in all pretty disappointing. You could say now that I maybe got a broken watch from the beginning on and that it is an exception. But you just have to check the comments on strava or facebook to realize that many others have the same problems like me. So I guess it’s just a bad product Suunto made. If you have the choice, I would highly recommend you to buy for example a garmin watch. As long as the Suunto 9 does not even fulfill basic tasks (heartrate or elevation) reliably, I do not know how to use them for serious training. In Performance mode Suunto 9 can actually last up to 34 hours if you turn off HR tracking and even longer if you turn on display timeout. Amer sports i selling SUUNTO to Chinese Anta Sports Products shoe maker. As far as I know, the original mid-September proposal from Anta (and FountainVest) was to purchase all of Amer and that no official action has been taken on the proposal. Bob, I think Anta is (was?) attempting to buy all of Amer Sports. So that would include Suunto, Arc’teryx, Salomon, Wilson, Louisville Slugger, and others. Nice review. I was eagerly waiting for the Suunto 9 to be released but now I’m resigned to waiting another 12-24 months to see if Suunto can work out all the kinks. I’m not interested in being a beta tester for a $600 watch so I’ll keep using my Ambit 3 Peak and then maybe buy a 9 down the road when it’s working and at a discount. With the latest firmware updates, the 9 has been consistently more accurate than my AP3 when compared side by side. That combined with the longer battery life make it a clear winner for what I need. I like this watch a lot. I’ve had it since July. It accurately warned me of the Saturday night storm pacing Hardrock. I really like the breadcrumb feature and the ability to change power mode on the fly. The HR monitor works well for me most of the time. I have some weird data on the bike, but otherwise it has been good. It tracks laps in the pool well. I’ve had weird stuff happen in Ultra mode when moving over to Strava. Really bad tracks that look fine in the Suunto land and turn into messed up data in Strava. My biggest pet peeve is that most standard sport modes don’t have clock time as a display. I have to either pause GPS to see the time or go onto Movescount to create custom sport modes, which is terribly tedious given that I run/mountain bike/road bike/rollerski/ski/etc. For a $600 watch, I would hope it would tell me the time. Amanda, are you aware that you can customise the modes in Movescount? I have just come from the Spartan Trainer Wrist HR and the lack of touch screen meant there was a button assigned to showing the time during a workout. On the Suunto 9, I have had to adjust my custom modes slightly to display time on the screen. Slightly annoying to have to set them all up again, but otherwise no issues after that!